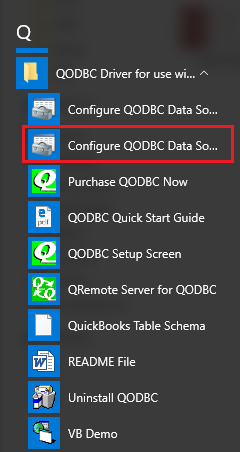 Testing under the 64-bit system, when using VB Demo test application, the user can see DSN (QuickBooks Data) in the ODBC manager, but when using other application or try to configure the DSN through ODBC manager, the user cannot find the DSN. Under the 64-bit system, there are two ODBC managers, one is for 32-bit and the other is for 64-bit. QODBC is 32-bit, so the default DSN (QuickBooks data) is 32-bit too. You cannot find it in 64-bit ODBC manager. Please use 32-bit ODBC manager to view and modify QODBC DSN. Please refer to this article: Vista/Windows 7 and 64-bit and QODBC for more detail information. And If the application cannot find QODBC DSN, it is probably because that the application is 64-bit. QODBC is 32-bit and it can not directly work with the 64-bit application. Please refer to this article: How to Configure QODBC to Work With 64-bit Applications for more information if you want to use QODBC with 64-bit applications.